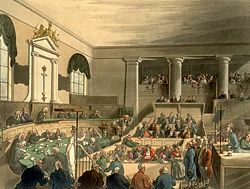 A trial at the Old Bailey in London as drawn by Thomas Rowlandson and Augustus Pugin for Ackermann's Microcosm of London (1808-1811). A court is a public forum used by a power base to adjudicate disputes and dispense civil, labor, administrative, and criminal justice under its laws. In common law and civil law states, courts are the central means for dispute resolution, and it is generally understood that all persons have the right to bring their claims before a court. Similarly, those accused of a crime have the right to present their defense before a court. Court facilities range from a simple farmhouse for a village court in a rural community to huge buildings housing dozens of courtrooms in large cities. As a forum where justice is judicially administered, a court replaces the earlier system whereby justice was meted out by the head of a clan or sovereign, and wherein peace had its foundation in the family or royal authority. As part of a well developed legal system, the modern court functions as a public forum where all aspects of the process of justice are presented by the members of the society, and every party has a right to present their case. Through such a system, peace and stability may be preserved. As a place where justice is judicially administered, courts hear cases and render judgments based on legal rules and precedents. The parties in court recognize the authority of this judicial tribunal and allow their legal controversies to be decided by peaceful means. Such judicial lawmaking includes decisions on the Constitution, torts, contracts, criminal law, criminal procedure, corporations, real property, civil procedure, evidence, remedies, wills and trusts, and community property. Courts keep the peace in dispute resolutions. The earliest form of courts were the special areas set aside for a tribal council, such as the European tribes of 3350-3140 B.C.E. (located between present day Austria and Italy) or the African tribes in 2000 B.C.E. (Kush tribe) for the ruling member of the family to decide controversies. Soon, sovereigns with their councils and retinues held court to hear disputes and render justice such as a Sumerian court in 2000 B.C.E..
Later, formal designations for the administration of justice were established in countries such as Egypt and Babylonia and spiritual rites and ceremonies were used to decide controversies. The use of religious rituals were replaced by peer groups in Greece which heard the arguments of the parties; however, the use of an impartial secular body which was formed to hear cases and render judgments appeared in Rome which formed the background of the courts in the modern world. In the United States, a court must have personal jurisdiction over a defendant to hear a case brought by a plaintiff against that defendant. There are three kinds of personal jurisdiction: in personam jurisdiction which gives the court power over the defendant; in rem jurisdiction which gives the court the authority to determine the rights of all persons to a thing located within the state; and quasi in rem jurisdiction which gives the court power to determine the rights of particular persons to specific property within the court's control. Generally, personal jurisdiction (in the United States) usually refers to the legal sufficiency of the connection between the defendant and the forum (the U.S. state) in which the court is located. The two major models for courts are the civil law courts and the common law courts. Civil law courts are based upon the judicial system in France, while the common law courts are based on the judicial system in Great Britain. In most civil law jurisdictions, courts function under an inquisitorial system. This is a legal system where the court, or a part of the court, is actively involved in determining the facts of the case, as opposed to an adversarial system where the role of the court is solely that of an impartial referee between parties. Inquisitorial systems are used in most countries in Europe and Latin America. The inquisitorial system applies to questions of criminal procedure as opposed to questions of substantive law; that is, it determines how criminal inquiries and trials are conducted, not the kind of crimes for which one can be prosecuted, nor the sentences that they carry. Since inquisitorial system courts help to develop the facts and procedural aspects of the case, this system proceeds on the concept of the defendant as guilty until proven innocent. In the common law system, most courts follow the adversarial system. This adversarial system (or "adversary system") is a system of law that relies on the skill of each advocate representing his or her party's positions and involves a neutral person, usually the judge, trying to determine the truth of the case. Since adversarial system courts make their judgments after hearing from each party, this system proceeds on the concept of the defendant as innocent until proven guilty. The inquisitorial system usually found on the continent of Europe among civil law systems (those deriving from the Roman or Napoleonic Codes) has a judge (or a group of judges who work together) whose task is to investigate the case. The adversarial system is the two-sided structure under which American criminal trial courts operate that pits the prosecution against the defense. A verdict is rendered when the most effective adversary is able to convince the judge or jury that his or her perspective on the case is the correct one. Procedural law governs the rules by which courts operate: civil procedure for private disputes (for example); and criminal procedure for violation of the criminal law. Each state establishes a court system for the territory under its control. This system allocates work to courts or authorized individuals by granting both civil and criminal jurisdiction (in the United States, this is termed subject-matter jurisdiction). The grant of power to each category of court or individual may stem from a provision of a written constitution or from an enabling statute. In English law, jurisdiction may be inherent, deriving from the common law origin of the particular court. For this purpose, courts may be classified as trial courts (sometimes termed "courts of first instance") and appellate courts. Some trial courts may function with a judge and a jury: juries make findings of fact under the direction of the judge who makes findings of law and, in combination, this represents the judgment of the court. In other trial courts, decisions of both fact and law are made by the judge or judges. Juries are less common in court systems outside the Anglo-American common law tradition. In the common law system, appellate courts may be arranged in a hierarchy and their function is to review the decisions of trial courts (and of lower appellate courts) and, generally, they only address questions of law—whether the lower courts interpreted and applied the law correctly—or procedure. These hearings do not usually involve considering factual matters unless new evidence has come to light. Such factual evidence as is admitted will only be considered for the purposes of deciding whether the case should be remitted to a first instance court for a retrial unless, in criminal proceedings, it is so clear that there has been a miscarriage of justice that the conviction can be quashed. An ecclesiastical court (also called "Court Christian" or "Court Spiritual") is any of certain courts having jurisdiction mainly in spiritual or religious matters. In the Middle Ages in many areas of Europe these courts had much wider powers than before the development of nation states. They were experts in interpreting Canon law, a basis of which was the Corpus Juris Civilis of Justinian which is considered the source of the civil law legal tradition. 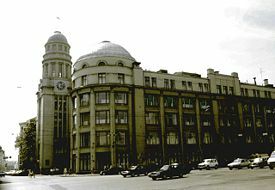 Constitutional court of Russia (architect Marian Peretiatkovich, 1912). A constitutional court is a high court that deals primarily with constitutional law. Its main authority is to rule on whether or not laws that are challenged are in fact unconstitutional—whether or not they conflict with constitutionally established rights and freedoms. On the other hand, there are countries who do not have separate constitutional courts, but instead delegate constitutional judicial authority to their supreme court. Nonetheless, such courts are sometimes also called "constitutional courts"; for example, some have called the Supreme Court of the United States "the world's oldest constitutional court" because it was the first court in the world to invalidate a law as unconstitutional (Marbury v. Madison), even though it is not a separate constitutional court. Austria established the world's first separate constitutional court in 1920 (though it was suspended, along with the constitution that created it, from 1934 to 1945); before that, only the United States and Australia had adopted the concept of judicial review through their supreme courts. A court-martial is a military court that determines punishments for members of the military subject to military law. Virtually all militaries maintain a court-martial system to try cases in which a breakdown of military discipline may have occurred. In addition, courts-martial may be used to try enemy prisoners of war for war crimes. Juvenile courts or "young offender courts" are courts specifically created and given authority to try and pass judgments for crimes committed by persons who have not attained the age of majority. In most modern legal systems, crimes committed by children and minors are treated differently and differentially (unless severe, like murder or gang-related offenses) in comparison to the same crimes committed by adults. One of the purposes for which juvenile court was founded was to give young, impressionable youth a second chance supposedly offering counseling and other programs for rehabilitation, as plain punishment was deemed less beneficial. Generally, only those between the ages of seven and thirteen years old are accountable in a juvenile court. Someone below age seven is considered too young to be held accountable, and those above age fourteen are considered old enough to be tried in adult courts. The business of small claims courts typically encompasses small private disputes in which large amounts of money are not at stake, usually a maximum of $5,000 in most U.S. States. The routine collection of small debts forms a large portion of the cases brought to small claims courts, as well as evictions and other disputes between landlord and tenant (unless the jurisdiction is already covered by a tenancy board). Typically, a small claims court will have a maximum monetary limit to the amount of judgments it can award; these limits vary. Upper limits are set in the thousands of dollars. By suing in a small claims court, the plaintiff typically waives any right to claim more than the court can award. The plaintiff is allowed to reduce a claim to fit the requirements of this venue. In some jurisdictions, a party who loses in a small claims court is entitled to a trial de novo in a court of more general jurisdiction and with more formal procedures. From the mid-nineteenth century, as a trustee charged with protecting their interests and property, the federal government was legally entrusted with ownership and administration of the assets, land, water and treaty rights of the tribal nations. On April 10, 1883, five years after establishing Indian police powers throughout the various reservations, the Indian Commissioner approved rules for a "court of Indian offenses." The court provided a venue for prosecuting criminal charges, but afforded no relief for tribes seeking to resolve civil matters. The new courts' rules specifically targeted tribal religious practices which it called "heathenish rites" and the commissioner urged courts to "destroy the tribal relations as fast as possible." Another five years later, Congress began providing funds to operate the Indian courts. In 1934 the Indian Reorganization Act, codified as Title 25, Section 476 of the U.S. Code, allowed Indian nations to select from a catalog of constitutional documents that enumerated powers for tribes and for tribal councils. Though the Act did not specifically recognize the Courts of Indian Offenses, 1934 is widely considered to be the year when tribal authority, rather than United States authority, gave the tribal courts legitimacy. In 1956, a U.S. Court concluded no law had ever established tribal courts, but nonetheless, decades of federal funding implied that they were legitimate courts. In some countries, provinces, and states, the supreme court functions as a "court of last resort" whose rulings cannot be challenged. However, in some jurisdictions other phrases are used to describe the highest courts. There are also some jurisdictions where the supreme court is not the highest court. 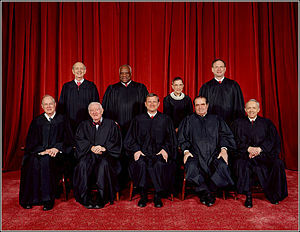 Although some countries and subordinate states follow the American model of having a supreme court such as the United States Supreme Court that interprets that jurisdiction's constitution, others follow the Austrian model of a separate constitutional court (first developed in the Czechoslovak constitution and Austrian Constitution of 1920). The constitutionality of a law is implicit and cannot be challenged. Furthermore, in countries such as Finland, Sweden, Czech republic, and Poland, there is a separate Supreme Administrative Court whose decisions are final and whose jurisdiction does not overlap with the Supreme Court. Most common law nations have the doctrine of stare decisis in which the previous rulings (decisions) of a court constitute binding precedent upon the same court or courts of lower status within their jurisdiction. International judicial institutions can be divided into courts, arbitral tribunals, and quasi-judicial institutions, and these institutions can also be divided into global and regional institutions. Courts are permanent bodies, with nearly the same composition for each case. Arbitral tribunals, by contrast, are constituted anew for each case. Both courts and arbitral tribunals can make binding decisions. Quasi-judicial institutions, by contrast, make rulings on cases, but these rulings are not in themselves legally binding; the main example is the individual complaints mechanisms available under the various UN human rights treaties. The International Criminal Court (ICC) was established in 2002 as a permanent tribunal to prosecute individuals for genocide, crimes against humanity, war crimes, and the crime of aggression, although it cannot currently exercise jurisdiction over the crime of aggression. The court came into being on July 1, 2002—the date its founding treaty, the Rome Statute of the International Criminal Court, entered into force and it can only prosecute crimes committed on or after that date. Although over 100 states quickly became members of the Court, and another 40 or so signed but did not ratify the Rome statute, a number of significant states, including China, India, and the United States, voiced criticism of the Court. The Court can generally exercise jurisdiction only in cases where the accused is a national of a state party, the alleged crime took place on the territory of a state party, or a situation is referred to the Court by the United Nations Security Council. The Court is designed to complement existing national judicial systems: it can exercise its jurisdiction only when national courts are unwilling or unable to investigate or prosecute such crimes. Primary responsibility to punish crimes is therefore left to individual states. In its first five years of operation, the Court opened investigations into four situations: Northern Uganda, the Democratic Republic of the Congo, the Central African Republic, and Darfur, and issued eight arrest warrants. Depending on the context, sanctions can be either a punishment or a permission; however, in a legal context, sanctions are penalties imposed by the courts. More specifically, sanctions are usually monetary fines, levied against a party to a legal action or his attorney, for violating rules of procedure, or for abusing the judicial process. The most severe sanction is the involuntary dismissal, with prejudice, of the complaining party's cause of action, or of the responding party's answer. This has the effect of deciding the entire action against the sanctioned party without recourse, except to the degree that an appeal or trial de novo may be allowed because of reversible error. Trade sanctions, economic sanctions applied for non-political reasons, typically as part of a trade dispute, or for purely economic reasons, and typically involving tariffs or similar measures, rather than bans. Abraham, Henry Julian. 1975. The judicial process: an introductory analysis of the courts of the United States, England and France. NY: Oxford University Press. This page was last modified on 10 December 2017, at 00:29.